I’ve spent a lot of time researching how to make jam! Recently, a good friend of mine asked for some advice for making jam, so I thought I’d share some of my findings with you after the jump. What’s The Difference Between Jams and Jellies? Jam is made with fruit and fruit juice – it’s chunky. Jelly is made with just fruit juice – it’s smooth. Jam’s easier to make – and maybe even a little healthier! Jam Jars? Canning Lids? What? What jars and lids you use for making jam depends on how you plan to store the preserve. …for giving as gifts, or storing to enjoy the year round – you need specially designed canning jars and lids. The jars are made of thick, tempered glass and can be reused indefinitely. The lids often come in two parts – rings and a flat lid piece. The rings can be reused, but the lids can’t. Lids are important – pieces of cellophane or wax tops are not safe. Canning jars aren’t hard to find. Ball Jars are the classic example and you can buy them for a small fortune online or in kitchenware shops. You don’t have to spend a whole chunk of money on canning jars though – my local supermarket carries a delightfully retro range which are very cheap and work perfectly. You’ll need to water process your jars (more info down page), but once their lids have ‘popped down’ from the vacuum created by water processing they’ll keep at room temperature for a year or more. …you can reuse any old jar, or use any clean container. Just make sure you keep your preserves in the fridge! Jams, jellies and marmalade are all made of two basic ingredients: fruit and sugar. The magic ingredients which get them to set are pectin and acid. Pectin and acid are found naturally in a lot of foods – apples are high in pectin, and lemons are high in acid. You can buy pectin and citric acid, but if you follow a trusted recipe (look for one with reviews), you shouldn’t need to add anything. Pour into jars, process and enjoy! Before you begin making jam, pop three or four saucers in the coldest part of the fridge. After you’ve boiled your jam for the amount of time specified in your recipe, drizzle a small amount onto a cold saucer. Push your index finger through the jam. If the jam has a skin which wrinkles – it’s done! Lick your index finger and pour your jam into jars. If your jam doesn’t set… keep boiling! You might also like to add a squirt of lemon juice to help the jam set. Watch out for recipes ‘handed down’ from before about 1990. In ‘the olden days’ folks didn’t follow the tough strictures we do now-a-days for making jam, and you could end up accidentally making a jar of strawberry-flavoured-food-poisoning, rather than strawberry jam. But what if you have a precious old recipe….? Research! Find a similar recipe that you know is safe, and figure out what’s different. You might find that your recipe is fine – or that Auntie Maud’s Famous Chutney needs an extra half cup of vinegar. You could end up with botulism. You don’t want botulism. Sterilise your jars, and always water process your preserves. Wash both the jars and lids in hot, soapy water. Place the jars in a cold oven and turn it on to 150° Celsius. Make sure that the oven gets up to heat before you fill the jars! Pop the lids in a pot of water, and bring it to the boil. Don’t keep the lids boiling – just keep them hot. This cleans them up, and softens the gummy jar sealing ‘stuff’ on their undersides. Water processing is only suitable for high acid preserves – such as jam or chutney. Low acid preserves like beans need to be processed in a pressure canner and are well out of my area of expertise. To water process the jars, place them in your large pot, cover with at least an inch of water, and bring to the boil (wrap the jars in tea towels to prevent them smashing against each other). Boil with the lid on for ten minutes (set a timer when the pot has come to a fast, rolling boil). If you’re above sea level you’ll need to boil the jars for longer. Why Go To All That Bother to Water Process Jam? Simple – you could get very sick! You might say: Pshaw! Folks have been making dangerous jam for centuries and no one ever got sick! I’d say: Maybe they all died of smoking, or not wearing seat belts instead. We’ve moved on, people. Safety first. You might say: But it takes too looooooong! I’d say: It takes longer to cook chicken to “well done” than it does to cook it to “rare” – but I bet you don’t skip that step! Check out the USDA website. I’ve given you a quick overview, but if you’re serious about learning how to make jam, I’d recommend taking an hour or so to thoroughly explore their website. This entry was posted in Preserves, Recipes and tagged Homemade Jam, Preserves, Recipes. Bookmark the permalink. I just love preserving food. Infact, I’m writing the cookbook on preserving food. This post is so informative and I can really use many good tips here. BEautiful! So you don’t use any pectin? I admire you. I use Pomona’s. 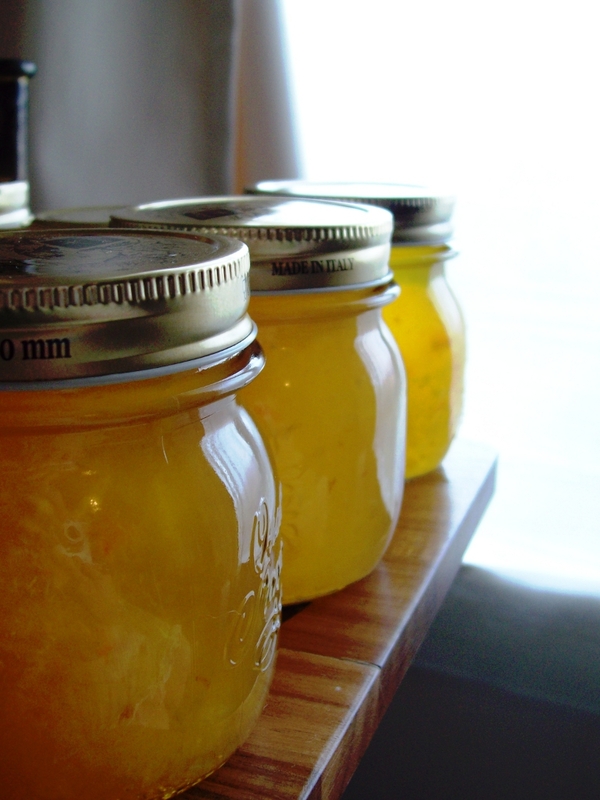 Here’s a tip: Skip the jar sterilization step by placing your jars on a baking tray in the oven at 200. Remove with tongs as you pour your jam. This is officially called the hot pack method and it is totally safe. Swear. Thanks for the comment! Apparently, whether or not you need pectin to reach setting point depends on the ammount of natural pectin in the fruit. I know I needed pectin for my berry jam, but not for my feijoa jam.